1) What street did you live on in third grade? 2) What was your childhood phone number including area code? 3) What is your maternal grandmother's maiden name? 4) What is the name of a college you applied to but didn't attend? 5) What is the license plate number of your dad's first car? 6) How many bones have you broken? 7) What was your childhood nickname? 8) What was the name of your first stuffed animal? 9) To what city did you go on your honeymoon? 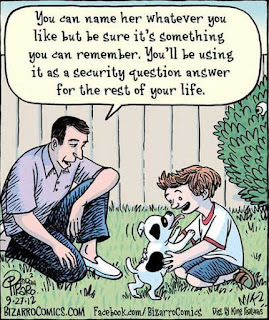 10) What was the name of your first pet? Can you think of another question that drives you crazy?